Concrete repair is valuable whenever you have an issue, regardless of the extent. Whether it is an aesthetic issue or threatening the structural integrity, our team can help you. When you are in charge of a structure, you will more than likely prioritise maintenance and repair tasks. Obvious cracks might be the first thing that gets your attention. Sometimes, this can lead to people ignoring issues that appear smaller like tiny foundation cracks. People might see something like this and believe that it is not dangerous and is something you should simply monitor. You need to pay attention to your structure, in particular the foundation. A problem like minor cracking indicates that there could be a more serious issue in development. Below you will find some reasons as to why it should be a priority. The weather affects your structure in different ways. For example heat makes it sink ever so slightly and the cold causes a minor but also significant rise. This stress can make any foundation issues worse and cause more problems such as broken pipes, resulting in the need for more repairs. You might only have foundation cracks but that doesn’t mean that the issue will stay located here. Stress like shifting of your structure can result in damage to other areas. You could find yourself dealing with damaged window wells and door frames among other issues. Avoid the need to worry about secondary issues like this by promptly fixing any problems as soon as you become aware that they need repairing. One of the biggest and most obvious reasons for repairing your structure early on relates to costs. Repair work will get more difficult the longer you wait. This is due to the cracks getting worse; what started out small could grow into something serious. 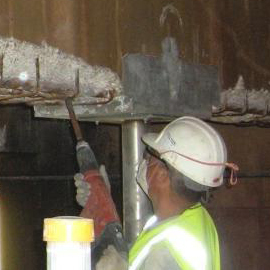 Churchill is highly experienced with different kinds of structural related work. Never hesitate with concrete repair to avoid complications and unnecessary expenses. You can rely on us so get in touch using 0844 474 0011.